First there was the trauma of the grounding in Marstrand at the start of Leg 9. 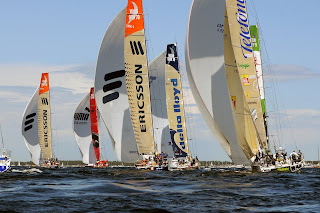 Then there was the desperate battle to repair Telefonica Blue and get her to Stockholm for the final In-Port Race. After days of 24/7 labour they made it and watch captain, Jonathan Swain looked me in the eye yesterday and told me that the repair hadn’t left the boat compromised for speed – somehow, they had got the keel fin and bulb straight and fair. Now, if they were to keep the dream of second place overall alive, all they had to do was maintain their awesome inshore record and beat PUMA in the in-port race series. So - after all that, the one thing this crew didn’t need was a lousy start to the first race. But there they were, at the top mark the first time – dead last. 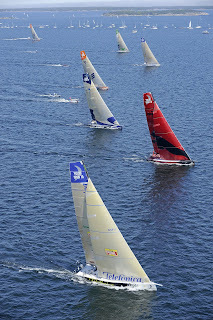 photo credit: Rick Tomlinson/Volvo Ocean Race. 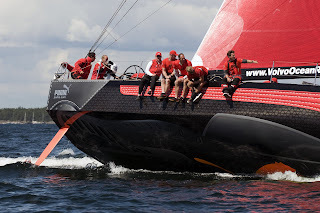 At that point, it would have been very easy for heads to go down, for a crew that has had such a rollercoaster ride around the world to have finally given up and accepted their fate – third place overall behind PUMA. But not Mr Bouwe Bekking and his brothers-in-arms, these guys aren’t top inshore boat in this Volvo Ocean Race for nothing. They immediately looked fast as they turned downwind - as they always have in lighter conditions. But as they started to reel in the tightly compressed pack, Bekking decided to split from the fleet. Telefonica Blue gybed first, and headed out to the western side of the race course. It looked a pretty radical move, especially immediately afterwards, as the group started to ease away from them. But what Bekking had spotted, and was about to utilise, was the key feature in the breeze that determined the rest of the afternoon’s racing – a geographic wind shift. The wind can shift in direction for a lot of reasons – changes in the isobars and pressure gradient, the thermal effects of the land and sea heating at different rates, but also the increased friction as the wind passes over the land rather than the water. This can set up what sailors call a geographical wind shift, a permanent feature in the wind that stays in place as long as it blows from one direction. 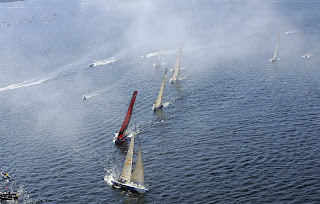 Today, in the ten knot south-southeasterly wind blowing over the islands surrounding the KanholmsfjÄrden, that geographic feature consisted of a wind that was blowing from a more easterly direction on the western side of the race course. It was in place virtually all day, and was particularly noticeable on the upwind legs. Boats that started the upwind leg on port tack and immediately headed that way were always able to make a course closer to the windward mark than those to the east. The move that saved Bekking’s day was to utilise this on the first run – way ahead of anyone else hooking into it. By gybing to the west early after mark one, they sailed themselves into the wind shift first. Once they gybed to port, the more easterly breeze provided them with a great angle down the course. They sailed straight down to the leeward gate with no more gybes, passing everyone that had favoured the eastern side of the race course – Green Dragon, Delta Lloyd, Ericsson 4, and rounding equal with Telefonica Black. There was still a long way to go – but Bekking again favoured the western side on the next beat, and actually led through the mid-course gate. If it wasn’t for tacking a little late for the final approach to the windward mark, they might well have rounded in the lead - but third at the finish turned out to be good enough. Telefonica Blue didn’t manage to get off the start line in the second race in such a position that they could get back out to that western side of the course. By then, everyone had figured out that it was the way to go both upwind and downwind, and there was a queue. PUMA and Telefonica Black led out to that side, and were the first to tack to starboard for their final approach to the windward mark. And this was where Telefonica Blue pulled their second (honourable mention) play of the day. This time around they picked the perfect spot to tack on the final approach to the windward mark. It was a confident move from navigator, Simon Fisher (who’s not had the best of weeks) - happy to call for the tack a long way short of where PUMA had chosen. 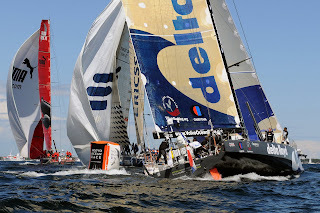 It worked out just fine; PUMA had gone too far, and Telefonica Blue saved themselves so much distance with the earlier tack, that they made up for the disadvantage of being on the wrong side of the first leg. Telefonica Blue rounded the first mark in the lead, but to win the day, PUMA had to come third or worse.